I love to hand embroider, especially freehand styles – lines or fillings, choosing from the multitude of stitches, & embroidering with a single strand of thread. 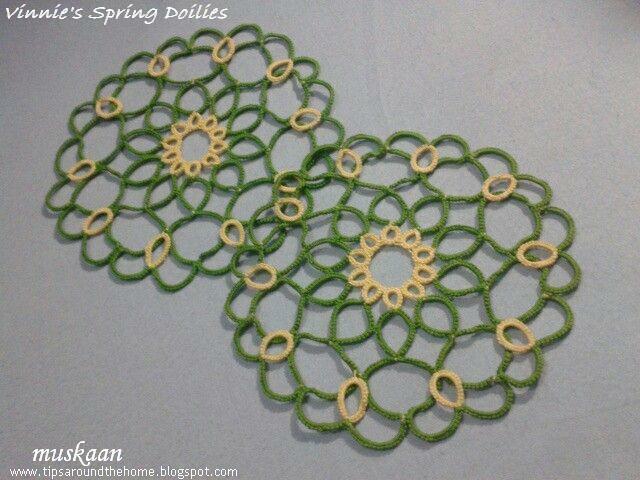 All 3 bookmarks are from my Edgings & Laces 3 : Embroidery board. 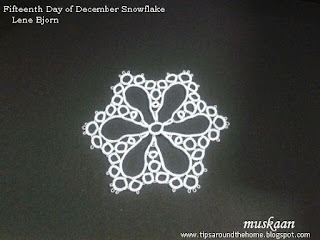 And unlike tatting where it is required occasionally, I had to wear my magnifier throughout. Excellent free pattern pdf, with choices for black & white or colour printing. The symbols & grid size made reading the pattern very easy. Changed the Anchor pale blue to a darker but brighter shade in silk thread . I like to thread multiple needles, especially when few stitches are required - hate long threads spanning the fabric behind. Threading multiple needles ahead saves so much time & one can maintain one's momentum & rhythm. Edged with brown satin ribbon. I had this long scrap strip of blue Aida left over from some old sewing (I had once sewn a seat cushion cover forthe swivel chaur in my study, using this blue Aida & corded piping in black). Plenty for a bookmark ! I deliberately chose a single colour. Would've preferred a silhouette, but the elegant curves in this pattern called out to me. I shifted the borders from the side (in original pattern) & moved them to the top & bottom. minor tweaks were made in order to maintain symmetry. All I had to do was fold the strip back on itself & sew – no separate lining required. (This is the true shade of fabric when seen for real). There isn’t a name, so I’m calling it my Fruity Delight !!! As I embroidered, fruits leaped to mind – strawberries, mangoes & purple raspberries ! I decided to not embroider the border (as in original pattern) - this looked soooo good & I feared a border would detract from the main body. One would've thought that I'd be bothered by the frequent changes of needles/colours/threads, but for me there's always a magical enigma in embroidery... to see a pattern on paper coming to life on fabric, is always so fascinating & I usually find it difficult to drag myself away. And counted cross stitch does have that element of a jigsaw puzzle - each cross is a tile or piece that needs to fit in precisely ! I like to try different things. Each of the 3 bookmarks has a different finish. Hand-sewed the first 2, & basted a satin ribbon edging for the first. Third was cut with a zig-zag scissors. The first bookmark has a printed fabric, chosen because of it's resemblance to the cross stitch pattern. Machine-sewed the ribbon. For the middle bookmark, I fabric-glued some scrap fabric. After it was dry, cut the edges with the serrated edge scissors. Even caught the ring finger skin between the handles (that scissor is pretty tough to handle!) & bled for a while. So, if you look closely, you will see the top right corner is not in line (seen in pic below). To make it a wee bit interesting, I’m interspersing the boring details with pics from my collection of books that have cross stitch patterns . I have this dream that when I finally give away my books, there will be a handmade bookmark, made in different media, in each book. All 4 books were handed over to me by my dear MIL. 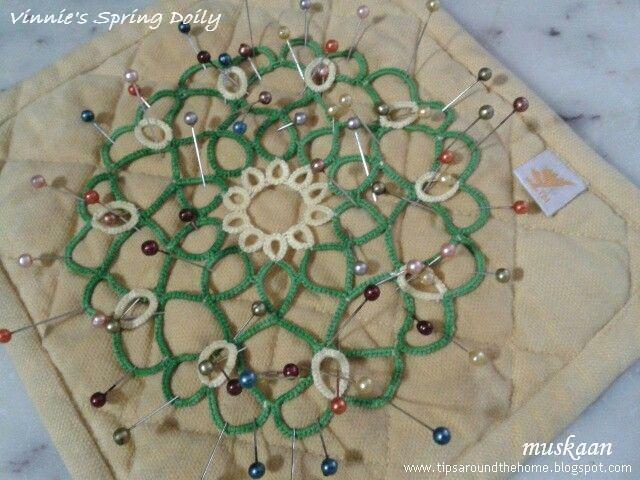 I have embroidered a wall hanging from the Motifs and Embroideries book. The other 3 booklets have some good border & filled-in designs, but too geometrical for my taste. These are notepads with grids. The left one has patterns collected from various sources & colour-coded. The right one is my working pad. When a pattern needs to be enlarged, as from the above books, I do it here, using colours &/or symbols. Makes it easy to keep track of the stitches & pattern. Bought a new one because this dance ain't ending here ! I bought these after my marriage & have made several projects from Creative Stitchcraft, which has more than just cross stitch patterns). I bought the left one specifically for one centerfold pattern, which, happily I did make. Will hopefully find the time to share them all some time. The weather calls for frequent cool refreshments; my memory calls for frequent refreshers ! This post is a refreshed version of my previous post where I had a posted a hasty response as update. I was not fully satisfied. Reason : I had tatted the SQDR in 2014 ; then the RR in 2015 ; and was writing the post in 2016. During the intervals neither of the two techniques were used. High time for a refresher course, right ?! And I needed to confirm my explanation/comparison. This time, trial tats are included for easy comparison. Also, as I hunted online, I found a few more tutorials/videos. Incidentally, I had already tatted samplers of some, & only later found that videos were already online. So here I go again …. SH1 – pink ; SH2 – shaded green. 2 colours used for clear distinction. Variegated thread gives more idea of the direction & progression. I start with a 1” long lock chain to show clearly where the threads emerge after central ring is closed. Disclaimer : This is not a tutorial but a collation/annotation of methods, with a few trials thrown in. The terminology, origin, & collection is limited to and limited by the knowledge & comprehension of the blogger, and to the resources consulted to date. The traditional method of tatting the ‘daisy medallion’1 is to make a central ring with picots, then cut & restart the next round, or climb out with a mock picot. The next round consists of rings that are joined at each picot either at their base when using single shuttle (with bare thread between rings) or at their tips with chains between adjoining rings when using shuttle & ball. But tatters have long since hit upon ways to tat rings directly on the central ring. These are called thrown off rings, thrown rings, or floating rings. No picots or second round required – all tatted in one pass. The thrown rings can also be Josephine rings. I continued the experiment a bit further, branching out to separate exit points or using 2 different ways to throw rings off the 1st side of a split ring. But these are off-shoots of the above set. One can also tat the central split ring using Dora Young Method and throw rings off it2, but it is rarely used for SRs any longer. If one is working with a single shuttle, then this can be an option. I must also admit that with the ease of tatting a SCMR, many of the other methods have limited use. A 3-page pdf includes the 3 pics above. Click here to download pdf . Since it is all tabulated/notated, I am restricting textual explanation here to comments/pointers & some tutorial links. Most useful when tatting with a single shuttle. 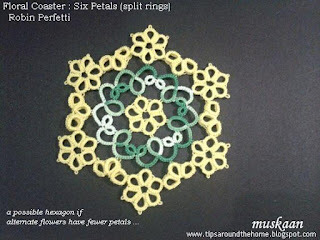 Some dexterity with finger-tatting is required (although loop can be inserted into a shuttle temporarily). Size of central ring & number of thrown rings are limited since the central ring is a true ring. 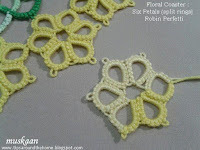 Tatting direction is opposite to that of LTROR, and central ring is tatted with reverse stitch instead of double stitch. Core thread differs from stitches, hence 2 shuttles required. Care must be taken when starting the ring. Limitations similar to LTROR. 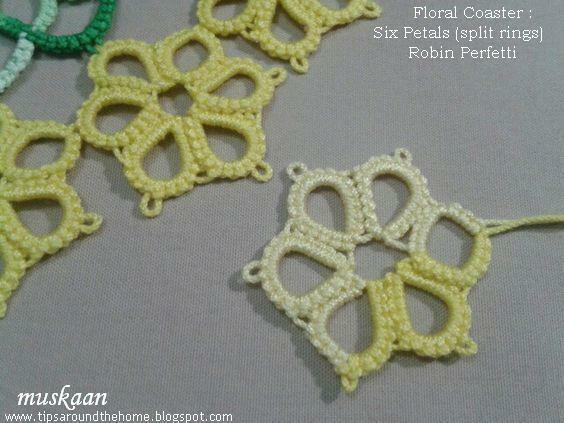 This method of tatting may be ‘normal’ for left-handed tatters. The 2nd model on right side has more DS on 1st side for comparison, but notice the exit of threads. Major limitation of Rings on SR is that thrown rings are made only on the shuttle2 side. This technique has solved all problems or limitations of above techniques. 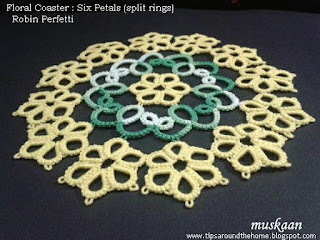 Rings can easily be thrown anywhere around the central ring; both central & thrown rings can be as large as one wants; the threads will emerge at the starting point; all tatting is from front in clockwise direction, using only DS. The only limitation is if one wants thrown rings in 2 different colours. Interestingly, side 2 is tatted first, then side 1. Multiple rings can be thrown on side 1 of the central ring, but the multiple loops are difficult to control. Moreover, since the loops remain open till the very end, size & number of rings need to be curbed. Requires quite a bit of practice, but if one single thrown ring is required, this can be adopted. Here are my trials with the MROR ... even with these many trials, I could not control the shape & the central ring tended to lose it's curve. Tried multiple little tweaks & kept referring back to the pictorial, diagrams & video. Finally I have come to 2 conclusions : the thrown ring has to have a certain minimum stitchcount for a good shape & control ; it may not be advisable to have a large central ring, or multiple thrown rings. One medium to large MR on a SR is ideal for me. This compilation has explored the various choices one has. But with the ease & scope of a SCMR, this has become a bit of an academic exercise. Notwithstanding, each technique can have it's advantages in specific situations, to get out of a tight corner, or for a designer. skill & comfort level of tatter. While deep into the Cluny Tatting series I posted last year, some relaxation & distraction was in line. It came in the form of this cute hedgehog pattern that I first saw on Craftree, here . 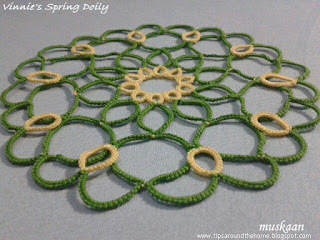 What drew me to the pattern was the use of Reverse Ring (RR) . 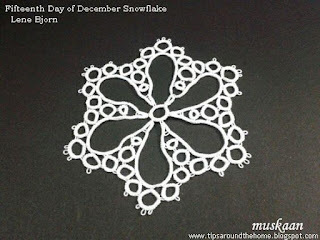 I hadn’t done this since my first time in Teri’s Dandelion ChainLink Bookmark ! High time I tried it again. (In 1998, Teri called it the Split Quadruple Directional Ring (SQDR). And sure enough I had forgotten ! SQDR or RR is tatted all from the front, including the thrown rings that emerge from it. But I used reverse order stitches in the thrown rings. That’s how the hedgehog turned !!! 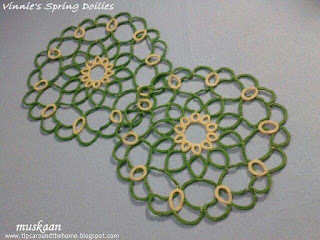 SQDR or RR, fs/bs tatting (RODS), decorative picots, thrown/floating rings, padded double stitch, SLT (or turn work/folded chain or direct tatting) , split ring, lock join. As mentioned above, I tatted the thrown rings in RODS. Decided to continue with RODS in chains, resulting in a hedgehog that faces the opposite direction to the one in the pattern ! This pic shows the hedgehog from the back side. Added more picots for a fuller spinier back. At one point I thought of making twisted picots (floating) but wasn’t in mood to do the twist. I most probably skipped the SLT for snout. Either made a folded chain (vsp, 2 half stitches) to turn the chain; or I may have switched shuttles for direct tatting (reverse stitch). I don't quite remember after 1 full year. 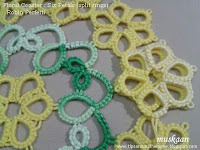 Used padded double stitch for tail : 1pds(3,3), 1pds(3,2), 1pds(2,2), 1pds(2,1). Tie & cut. Basically, 4 padded ds with decreasing number of wraps . I could’ve added a black seed bead for eye. (shown in the pic is a painted black eye). The piece is unblocked - fresh off the shuttles. 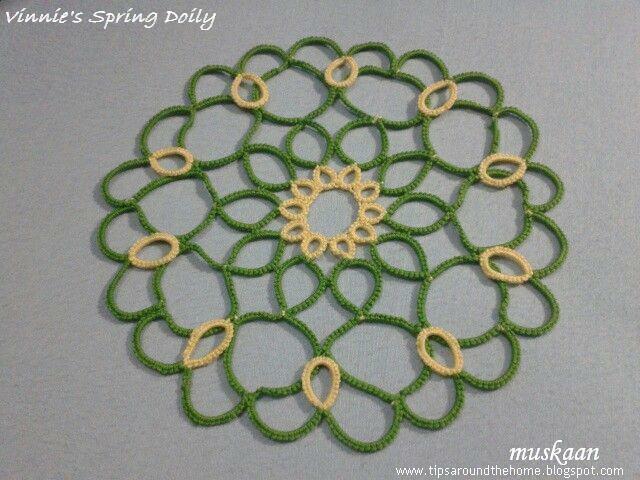 I'm on a tatting-free break for the past week in order to recharge my batteries. Yes, there is a whole backlog of posts (projects, tat-alongs, tutorials) & tatting to accomplish, but it was getting stressful & slow-paced. I am, however, taking this opportunity to upload some such old projects & reduce the backlog a tad. This segment is in response to a question in the comments below. It is a quick post, & limited to my understanding at this point in time. Hope there are no errors ! I have included 5 techniques by which we can have thrown rings on a ring : SQDR, RR, SCMR, LTROR. 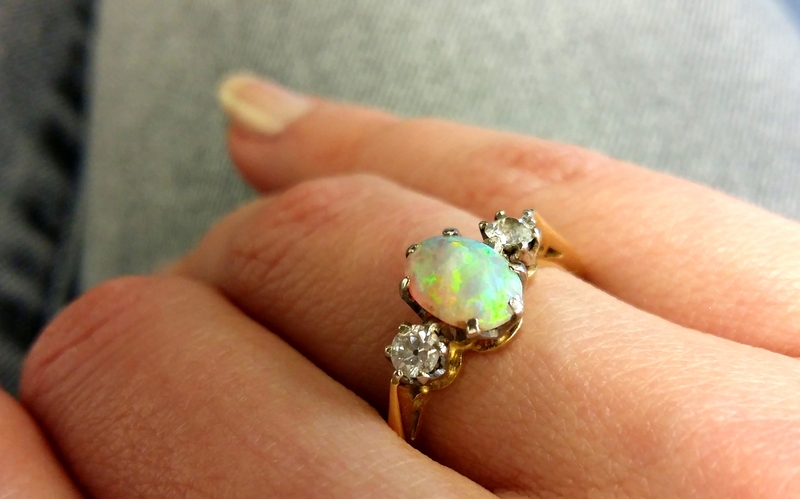 or Reverse Ring (Ruth Perry) ? 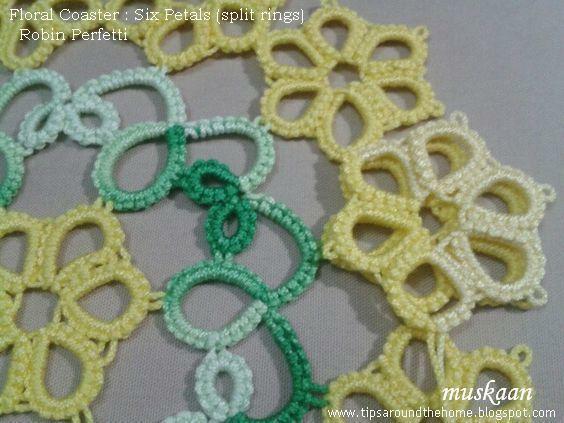 I learned Split Quadruple Directional Ring SQDR from Teri’s instructions & diagrams which form part of her bookmark pattern. Can perhaps be called Split Ring with thrown rings or Rings off Split Rings. 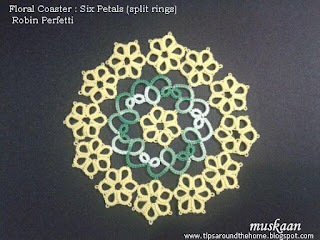 I don’t have Ruth’s tutorial or instructions for Reverse Ring (RR). But her RainBeau hedgehog pattern instructions/diagram seemed to suggest that it was very similar to SQDR. So what is SQDR or RR ? 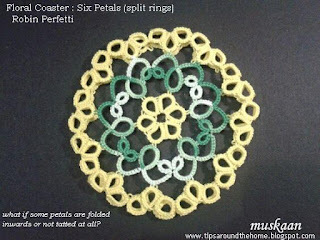 It is a ring worked with direct tatting or like the 2nd half of a split ring. We start with a loop of SH1, but use SH2 to make the unflipped stitches, thus moving in a counterclockwise direction. Rings can be thrown off this central ring, using SH2. The entire central ring can be completed in this fashion & it will be a RR, as in the hedgehog above. 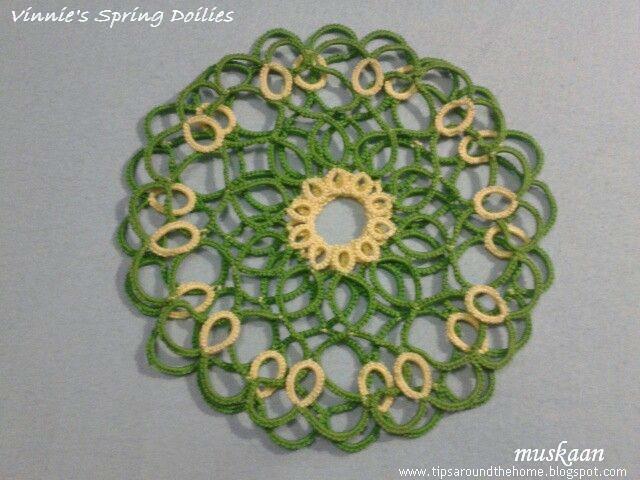 The central ring can be started as a split ring (SR) & then worked in direct tatting, making it a SQDR. 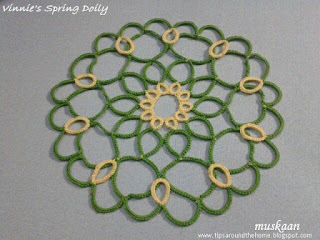 (in this case, rings can also be thrown off with SH1 on the 1st side of SR), as in the Dandelion ChainLink bookmark pattern where the first part of central ring starts with a single double stitch. 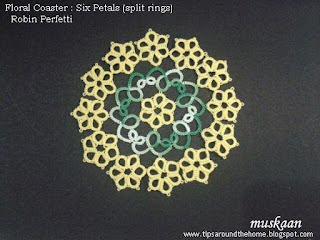 The rest of the pattern is worked as a reverse ring with thrown rings. In both cases, we are tatting True Rings. We need to remember to post the shuttle through ring before closing it. This video of Rings off Split Rings by Karen Cabrera will give a very good idea of how to work such rings, and the possibilities can be visualized. 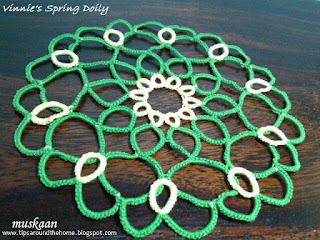 We can get the same effect using SCMR, which is perhaps easier if one is not used to direct tatting. In Self Closing Mock Ring, the central ring is a Mock Ring - a chain, from which rings can be thrown off. 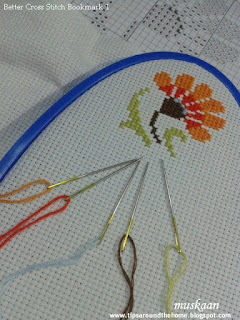 It is worked in clockwise direction, with normal Double Stitches. And we need to post the shuttle through the loop left at the beginning, before tensioning it. In SCMR, all thrown rings are limited to SH2 (as in RR). Another technique where we can throw rings off a ring is Loop-Tatted Ring on Ring (LTROR). In relation to the above : It is a True Ring. The thrown rings are also true rings, tatted using a loop pulled out from the ring loop itself. 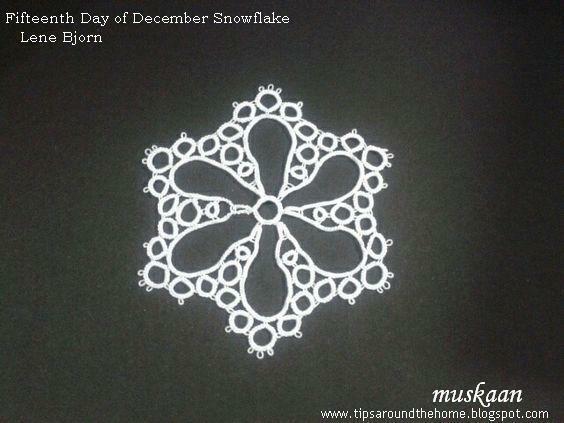 Tatting follows a clockwise direction. 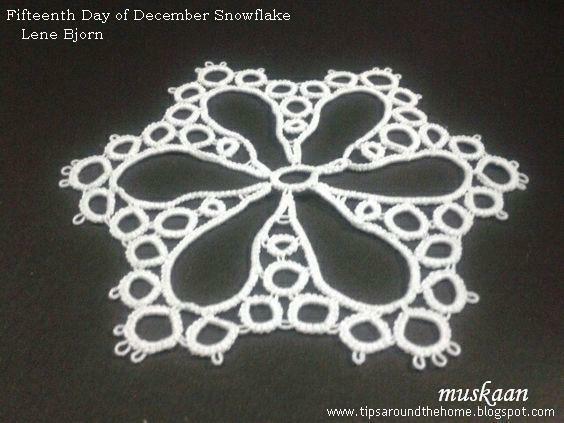 I used LTROR for part of Iris Niebach's doily It has an added advantage of being naturally blipfree, unlike a SCMR. Another advantage : these can be worked with a single shuttle. In all the above 4 methods, multiple rings can be thrown all around the central ring. And when the central ring if finally closed, the thread(s) emerge at the base/start. SQDR & RR are worked in counterclockwise direction, and we need to tat the thrown rings from the backside of the work ; LTROR & SCMR are worked all from the front, in clockwise direction. SQDR, RR, SCMR require 2 shuttles ; LTROR can be done with single shuttle & finger tatting. SQDR, RR, LTROR are true rings ; SCMR has a central mock ring. number of shuttles used, etc. No, I am not trying to twist your tongue; tongues can be very slippery. Last year, while tatting the Wiosna, I was distracted by Vinnie’s doily. 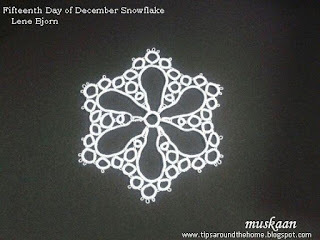 Elegant pattern & tatting, one-pass design, with just that hint of dimensionality that I adore. Started with size 20 shaded green, but abandoned after one bobbin ran out of thread. It was too fiddly, I didn’t like the colour, & the chains were ugh !. However, it helped to orient my head to the pattern & memorize it. Hmmm, seems I didn’t take a pic. Started afresh with 2 colours this time. ~ 5” in size 20 Anchor Mercer Art 4054. yellow – 0293; green – 0239. Long Chains needed to be steadied, especially when part of it was folded. Chain tension is crucial. I snugged the chain stitches too tightly. This was the first time I had blocked with pins. Since it was a small piece, I used a hot pad. In hindsight, the quilted surface could not have helped & I should've dampened the lace more. But it was better than an unblocked piece & I was okay with it. This coaster was placed under the crystal candle-stand on the dining table & soon I noticed that the outer chains ruffled upwards !!! What happened ?! Was my chain tension so tight ? Overall, it still looked good – like a green wave around the crystal – nice 3D effect ! 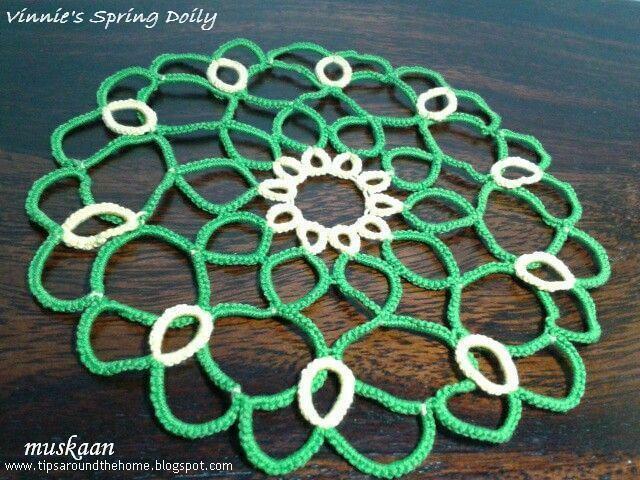 But tatting-wise it made me restless & I started another one…. I wanted to see whether my long chain tension & 'twist' could be improved. 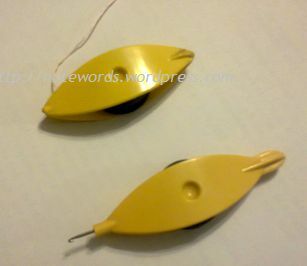 TIP : To place marker (paper clip) : Pull a loop of the core thread.. Make the first DS. Then insert marker. For me, this works out neater, less fiddly, and easier to join with later. I guess it did turn out neater, with more even chains. side by side. The new & the old are easily identifiable. One minor point about pattern : Ch20 is mentioned at both ends of the repeat (within asterisks). It should be made only once. Hence the asterisk should be shifted at one end. When this new one was blocked & placed in the same way as the older one, the SAME thing happened – it formed waves !!!! Why ?! What was I doing wrong ? Or was the candle stand too heavy ? No, I have paced other coasters under it . I kept close vigil & caught the culprit red-handed. Yup, my dear husband was not lifting the coaster & stand while dusting the surface, thus causing the lace to ruffle up. Oh dear . This is what comes of delegation. 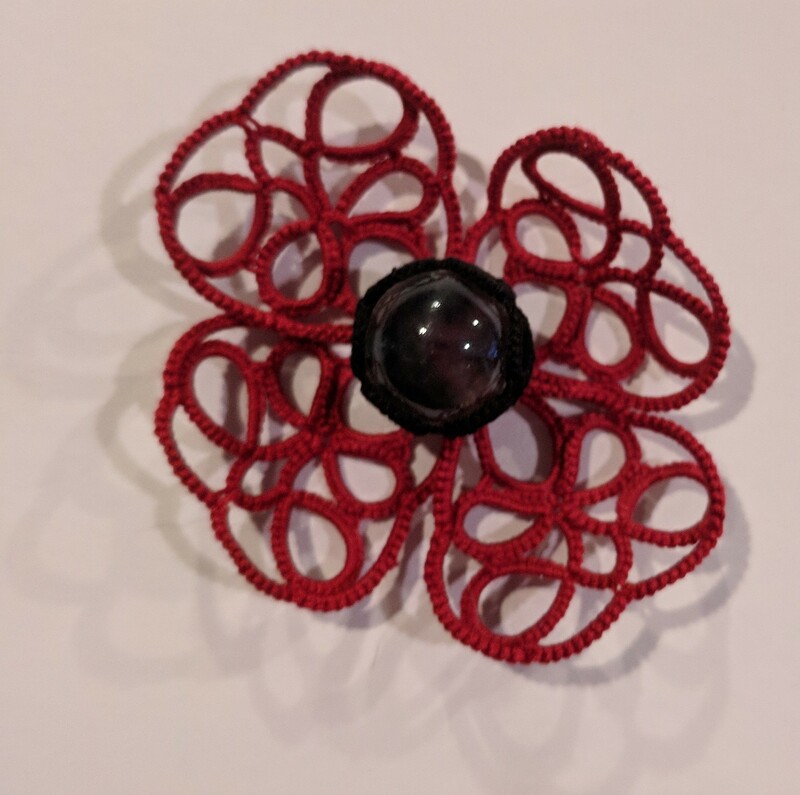 Vinnie has some lovely interesting & innovative pieces , including free patterns, on her blog (but the esnips links don’t work any more). Unfortunately, she has stopped blogging... there is a lot of inspiration & ideas to be gained there. Fifty-fifty, not too bad ?! We never had any doubt that tatters are a generous community. Yet it was a Hugely pleasant surprise to get this in my mailbox … For Robin to send me her hard-worked Tatted Coaster pack for free ?! WOW. Do I hear you joining in my applause to her ? “Thank you” doesn’t capture half the gratitude I feel for Robin . I can only try my best to live up to her expectations as a designer-par-excellence …. 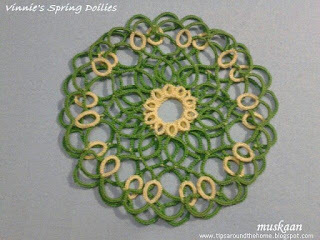 Techniques : rings, chains, split rings, directional tatting. Since I don’t have shaded yellow, this is what I thought I’d do – load each shuttle with a different shade. Tried one & wasn’t sure. Played it safe & used the same shade throughout. I forgot to join the 1st flower as per pattern, resulting in the entire 3rd round being tatted counterclockwise. Very quick & relaxing tat. And below are 2 possible variations. 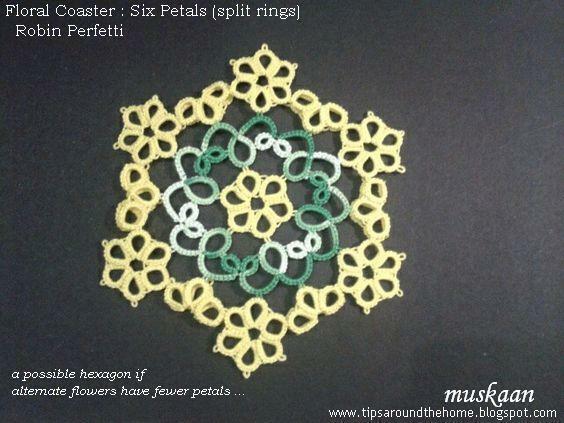 Simply by missing out a few petals strategically, we get a hexagon. Materials : 2 shuttles, Anchor Mercer size 40 thread in white. Straight off, I am NOT happy with my working. 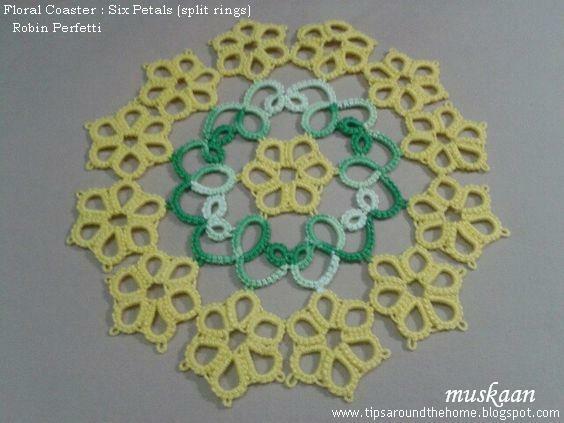 Learning from my Day 10 mistakes, I used regular picots instead of smaller picots at joins. But there were other problems as well. I kept getting confused with the number of thrown rings & had to unknot & retro-tat a few times. Finally gave up & started afresh. Still made a few mistakes but most caught in time. 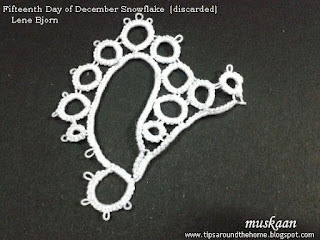 At the end, before hiding the tails, I kept tugging at the SCMR thread, hoping that the snowflake chains would fall into place better. Big mistake – a tug too many! It made the chains more crammed at the base; they were lying a bit better earlier. Started with a SCMR instead of a regular ring. I think it is Frivole’s tip that SCMR gives a more rounded ring than normal/regular rings which tend to become tear-drop shaped. 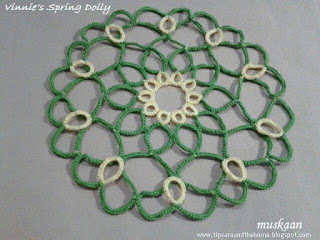 Because of SCMR, entire tatting was done from the frontside. Mock picots added at base of thrown rings to mirror the picots on other side, thus achieving complete symmetry. Picots on the extreme rings were decorative & graduated. Kept the chains loosely tensioned to mold into shape before blocking. the negative space can be converted into a paisley ! The lop-sidedness/unevenness of chains have given me an idea of how to change the shape deliberately to get a slight paisley effect negative space, instead of the big tear-drop, as can be seen in the pic above. Will definitely be tatting another, working away the mistakes (hopefully). bookmarked for a diet !